Bio-MSM+Silica is a combination of MSM and Equisetum Arvens L (horse tail extract), which contributes to the maintenance of skin, hair and nails. MSM is a naturally occurring organic sulphur containing substance, which is found in grain products, legumes, eggs and red meat. Vegetal silica, an extract of the herb horsetail grass, is a natural source of the essential trace mineral silicon. Sulphur and silicon are required by the body for the normal growth and development. The level of silica in the body declines with aging. 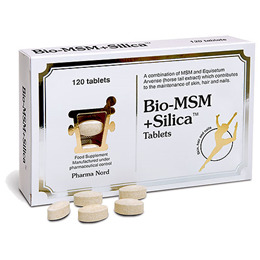 MSM and silica are required for the formation of bone, collagen in connective tissue (cartilage, tendons, ligaments), and for healthy skin, hair and nails. MSM and silica can help maintain the flexibility of joints and arteries. MSM (Methyl Sulfonyl Methane), Bulking agent: Microcrystalline cellulose, Horse tail powder extract (Equisetum Arvens L), Firming agent: Silicon dioxide, Glazing agent: Hydroxypropyl methylcellulose, Anti-caking agent: Magnesium salts of fatty acids. 2 tablets per day, or as directed by a physician. Nutritional supplements should not be used as a substitute for a varied diet and healthy lifestyle. 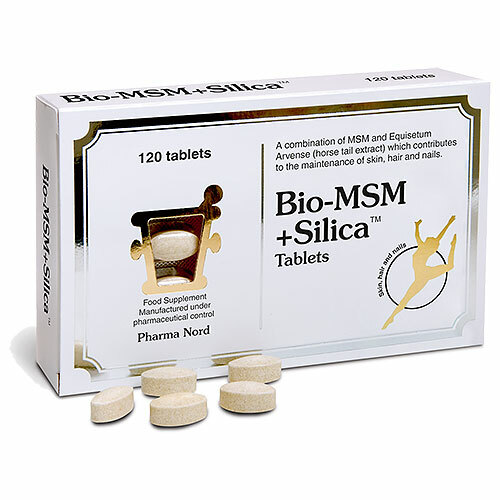 Below are reviews of Pharma Nord Bio-MSM+Silica - 120 x 750mg Tablets by bodykind customers. If you have tried this product we'd love to hear what you think so please leave a review. I have used this product along with an iron supplement as I have suffered anemia in the past. My hair had become dry and brittle, I also lost density resulting in a bald patch. The effect this had on me was horrendous, low self esteem feeling depressed. But I researched vitamins and came across this supplement and it is brilliant it takes time it's not a quick fix but it does work. I have regrowth, I have shine, I am not embarrassed about my hair. It works.